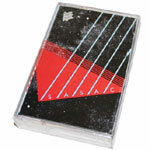 Stockholm native, SASAC, delivers a deep range of multi layered melodic synth and hypnotic guitar arrangements. Carving out an unmatched style that takes modern funk and soul through a natural evolution some are calling GWAVE. SASACs silky smooth style brings listeners to the high value production reminiscent of Mic Murphy, Howard Johnson, and Kashif, among others in the mid 1980s. This 16-track cassette gem presents us with a new facet in MODERN FUNK.